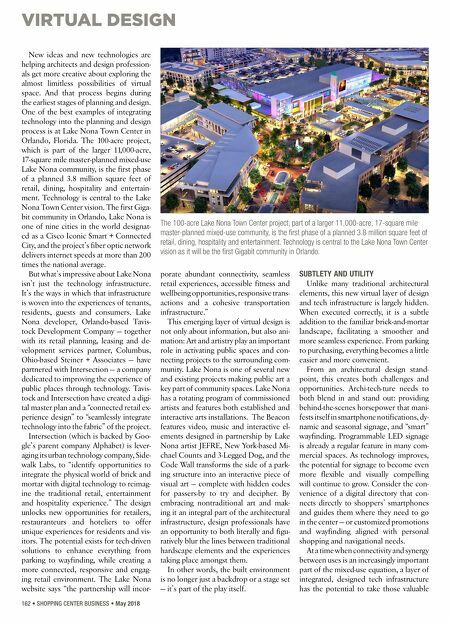 VIRTUAL DESIGN 162 • SHOPPING CENTER BUSINESS • May 2018 New ideas and new technologies are helping architects and design profession- als get more creative about exploring the almost limitless possibilities of virtual space. And that process begins during the earliest stages of planning and design. One of the best examples of integrating technology into the planning and design process is at Lake Nona Town Center in Orlando, Florida. The 100-acre project, which is part of the larger 11,000-acre, 17-square mile master-planned mixed-use Lake Nona community, is the first phase of a planned 3.8 million square feet of retail, dining, hospitality and entertain- ment. Technology is central to the Lake Nona Town Center vision. The first Giga- bit community in Orlando, Lake Nona is one of nine cities in the world designat- ed as a Cisco Iconic Smart + Connected City, and the project's fiber optic network delivers internet speeds at more than 200 times the national average. But what's impressive about Lake Nona isn't just the technology infrastructure. It's the ways in which that infrastructure is woven into the experiences of tenants, residents, guests and consumers. Lake Nona developer, Orlando-based Tavis- tock Development Company — together with its retail planning, leasing and de- velopment services partner, Columbus, Ohio-based Steiner + Associates — have partnered with Intersection — a company dedicated to improving the experience of public places through technology. Tavis- tock and Intersection have created a digi- tal master plan and a "connected retail ex- perience design" to "seamlessly integrate technology into the fabric" of the project. Intersection (which is backed by Goo- gle's parent company Alphabet) is lever- aging its urban technology company, Side- walk Labs, to "identify opportunities to integrate the physical world of brick and mortar with digital technology to reimag- ine the traditional retail, entertainment and hospitality experience." The design unlocks new opportunities for retailers, restauranteurs and hoteliers to offer unique experiences for residents and vis- itors. The potential exists for tech-driven solutions to enhance everything from parking to wayfinding, while creating a more connected, responsive and engag- ing retail environment. The Lake Nona website says "the partnership will incor- porate abundant connectivity, seamless retail experiences, accessible fitness and wellbeing opportunities, responsive trans- actions and a cohesive transportation infrastructure." This emerging layer of virtual design is not only about information, but also ani- mation: Art and artistry play an important role in activating public spaces and con- necting projects to the surrounding com- munity. Lake Nona is one of several new and existing projects making public art a key part of community spaces. Lake Nona has a rotating program of commissioned artists and features both established and interactive arts installations. The Beacon features video, music and interactive el- ements designed in partnership by Lake Nona artist JEFRE, New York-based Mi- chael Counts and 3-Legged Dog, and the Code Wall transforms the side of a park- ing structure into an interactive piece of visual art — complete with hidden codes for passers-by to try and decipher. By embracing nontraditional art and mak- ing it an integral part of the architectural infrastructure, design professionals have an opportunity to both literally and figu- ratively blur the lines between traditional hardscape elements and the experiences taking place amongst them. In other words, the built environment is no longer just a backdrop or a stage set — it's part of the play itself. SUBTLETY AND UTILITY Unlike many traditional architectural elements, this new virtual layer of design and tech infrastructure is largely hidden. When executed correctly, it is a subtle addition to the familiar brick-and-mortar landscape, facilitating a smoother and more seamless experience. From parking to purchasing, everything becomes a little easier and more convenient. 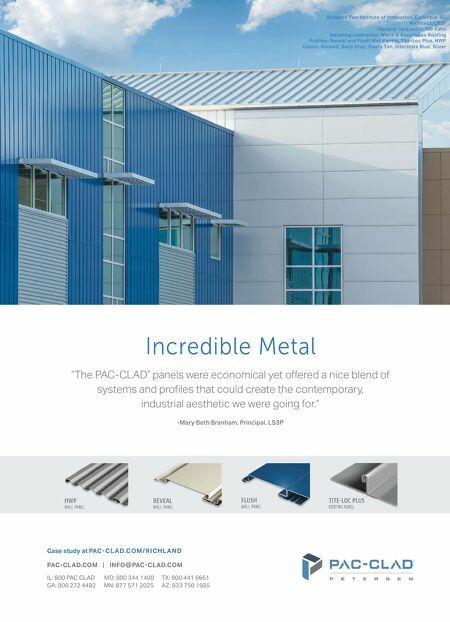 From an architectural design stand- point, this creates both challenges and opportunities. Archi-tech-ture needs to both blend in and stand out: providing behind-the-scenes horsepower that mani- fests itself in smartphone notifications, dy- namic and seasonal signage, and "smart" wayfinding. Programmable LED signage is already a regular feature in many com- mercial spaces. As technology improves, the potential for signage to become even more flexible and visually compelling will continue to grow. Consider the con- venience of a digital directory that con- nects directly to shoppers' smartphones and guides them where they need to go in the center — or customized promotions and wayfinding aligned with personal shopping and navigational needs. At a time when connectivity and synergy between uses is an increasingly important part of the mixed-use equation, a layer of integrated, designed tech infrastructure has the potential to take those valuable The 100-acre Lake Nona Town Center project, part of a larger 11,000-acre, 17-square mile master-planned mixed-use community, is the first phase of a planned 3.8 million square feet of retail, dining, hospitality and entertainment. Technology is central to the Lake Nona Town Center vision as it will be the first Gigabit community in Orlando.